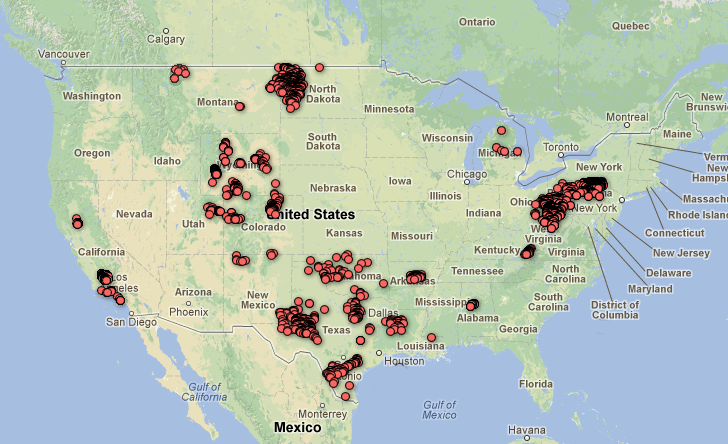 It seems that every week there is new information on the dangers of hydraulic fracturing. We have seen a massive uprising to oppose this latest form fossil fuel extraction from the oil & gas industry and grassroots activists are doing their own research to counter the claims of the fossil fuel industry. We reported a month ago about a forum held in Kent County, where the DEQ representative gave out a source dealing with what chemicals were used in fracking. The source, Frac Focus, is an industry website, where the companies involved in fracking are supposed to “self-report” on what chemicals they are using. As a counter to this source, a new chemical fracking disclosure database has been created by the group, SkyTruth. Using the data from Frac Focus, SkyTruth is taking the information further and making it more accessible to the public. Responding to public calls for greater transparency Texas, North Dakota, Pennsylvania and five other states require disclosure via FracFocus. But with the limited tools provided by FracFocus, data aggregation and analysis is impossible. Despite these and other critical shortcomings, the White House has suggested FracFocus is a suitable platform for public disclosure. More states are considering relying on FracFocus to address increasing public pressure for disclosure. The Bureau of Land Management is finalizing new rules for fracking that will apply to drilling on millions of acres of public land, and may be on the verge of designating FracFocus as the public disclosure platform. But we think the data must be much more accessible, shareable, and useable for the public to be adequately informed about the types and amounts of chemicals used in fracking operations. 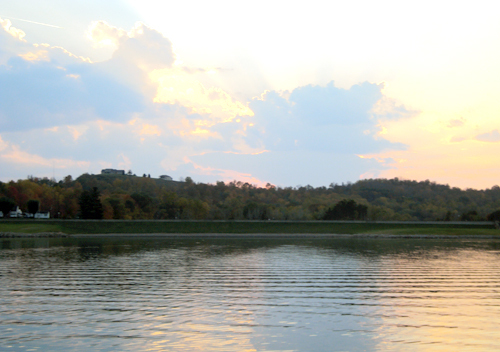 A report commissioned by citizens opposed to hydraulic fracturing has identified grave public health and environmental risks in plans to lease public land for fracking near Muskingum Watershed Conservancy District (MWCD) reservoirs in Ohio. The report, written by Paul Rubin, a high-profile New York Hydrogeologist and president of HydroQuest, warns of toxic water contamination sources which will be created by fracking near and underneath the lakes. The report was sent to the MWCD along with a demand letter that there be an immediate moratorium of indefinite length imposed upon hydraulic fracturing on any MWCD lands and underneath all MWCD reservoirs, and further, that there be a permanent policy to not sell reservoir water for fracking. Gas and oil wells, some drilled more than half a century ago, have weak or failing plugs of questionable integrity. The ability of aging, incomplete and absent well sealant (i.e., plug) materials to keep toxic contaminations out of freshwater aquifers, reservoirs and waterways is poor and short-lived. Cement sheaths, steel casing and clay plugs of known wells are failing or will fail within anywhere from a few years to decades, thereby creating new pathways for explosive methane gas and fracking poisons to flow into drinking water sources. Huge fracking pressures will blow out weak clay plugs in old wells, many beneath reservoirs. Earthquakes will further shorten the limited durability and life span of well sealant materials. Repeated hydraulic fracturing will result in interconnecting natural and created fractures and old, poorly plugged, gas and oil wells, allowing upward contaminant migration into drinking water supplies, including reservoirs. Toxic hydrofracking fluids injected deeply in the ground will move with groundwater flow systems, eventually moving upward into freshwater aquifers, reservoirs and waterways. Permitting of horizontal gas wells proximal to reservoirs will needlessly jeopardize water quality. 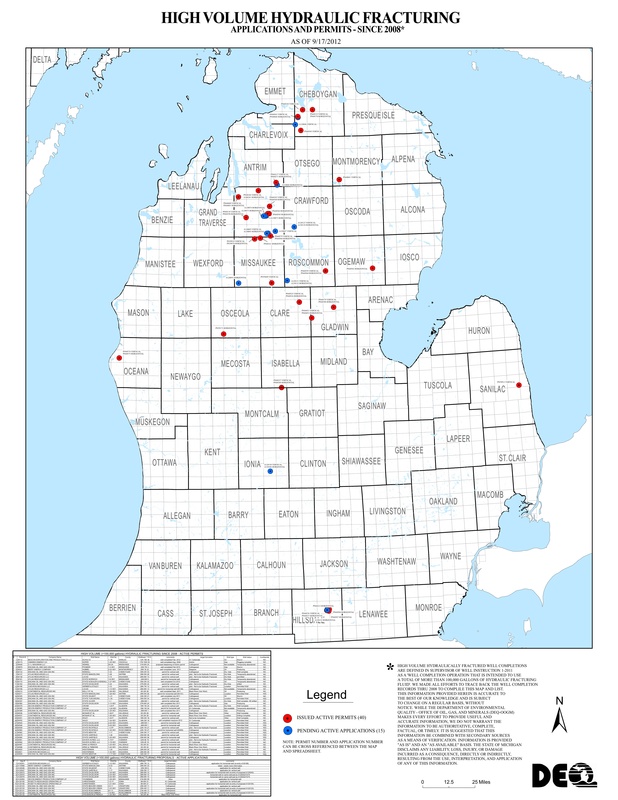 Lastly, a Michigan anti-fracking activist sent us the most current map of where high pressured hydraulic fracturing is taking place in Michigan. There are 40 well permits (for vertical and horizontal fracking) and 15 pending in the state. As you can see from the map, most of the fracking is taking place north of Kent County, but since mineral rights have been purchased in Kent, Allegan and Barry County over the past 6 months, we can expect to see new fracking sites in West Michigan.